Through dedication to our customers and a commitment to high quality, we know that we can offer you the very best in self build and diy conservatory styles and design. Thank you for your interest in our synseal diy conservatory kits. Please take a moment to browse through our site, see pictures of our conservatories and learn more about our company, products and the services we can provide you with including our cheap conservatory prices. If you have any questions, comments or would like to receive a conservatory self building or installation quote, please feel free to contact us. Also ask about our pvc windows, doors and kitchen conservatory. Our outlet supplies DIY Conservatories nationwide as well as these convenient local locations; Bromsgrove, Halesowen, Dudley, Stourbridge, Pedmore, Solihull, Shirley, Birmingham, Wolverhampton, Walsall, Redditch. You can be assured that our conservatory prices are competitive, so please don't hesitate to contact us. We are here to serve your needs and look forward to hearing from you soon. The gable conservatory is a light and modern conservatory that brings your garden into your home. We only use Synseal products to manufacture our Gable DIY conservatories. The P-Shape Conservatory is a large conservatory that can offer the flaxibility of two living spaces. 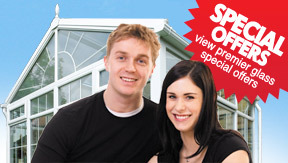 We only use Synseal products to manufacture our P-Shape DIY conservatories. The Victorian conservatory is the traditional conservatory which adds an elegant space to your home. We only use Synseal products to manufacture our Victorian DIY conservatories. The Edwardian conservatory is a great way to add versatile living space to your home. We only use Synseal products to manufacture our Edwardian DIY conservatories. The Lean-To conservatory is the original sun lounge and an asset to any home. We only use Synseal products to manufacture our Lean-To DIY conservtories.